I’ve been in London over the last week. It’s been great fun. I have walked almost five miles a day, tried fish and chips, visited Churchill’s War Room, seen two amazing plays and moved very carefully around our very small hotel room (rooms are much smaller here) with my much taller husband maneuvering himself so we don’t bump into one another too often! But, all kidding aside, this has been a highlight of my life. Ever since I came out with The Nanosecond Networlders with my colleague, David Stover, I envisioned a time when I would come to Europe and start Networlding Circles. I wanted to extend beyond the US Networlding Circles where people practiced values-based networking, using a more intentional and leveraged way of networking and growing more and more waves of collaborative circles for “the greater good” (which, by the way, helps individual goal achievement while accelerating community or group goal achievement). Become a Networlder. 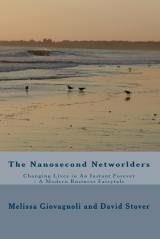 A Networlder, unlike a networker, has ten or fewer key people they consider partners. These partners are participants in regular exchanges of emotional support, information, knowledge, promotional support as well as leads and referrals for new business or career opportunities. The focus of Networlding is on mutually beneficial exchanges with like-minded and like-valued people. The great thing about Networlding partnerships is that they are fun and get results three to five times as fast as traditional networking relationships. Create a Primary Circle. We all have networks. We just don’t necessarily realize it and we spend most of our time with a few people. Networlding is about becoming aware of our network and consciously creating exchanges with a few people who become our Networlding partners in a primary circle. Social science research suggests that we can’t communicate regularly with more than 15 people. Primary circles, we have found, work best when no larger than 10 people. Initially, you only need one Networlding partner in your Primary Circle. In an extensive study we did with 200 executives, we discovered that the majority of people connect with only five Networlding partners once a month, every month. This means that even one person with whom you share similar or complementary values, and who is ready, willing and able to become a Networlding partner, can create a whole new world of opportunities for you and you for them. Find Networlding influencers for your Primary Circle. We define Networlding influencers as people who know how to influence and are ready, willing and able to do so for you and others with whom they Networld. For example, you might know people in your industry who are highly influential but are not Networlding influencers because they keep their power to themselves. Put others in Secondary and Tertiary Circles. Again, whether you consciously do this or not, some people will fall into your secondary or tertiary circles. People who might go in a secondary circle are those who are not, right now, ready, willing or able to exchange with you once a month. These are people, however, with whom you should stay in contact with and connect every three months. Tertiary circles are for almost everyone else, because you never know who might become a good partner later and vice versa.